Alice Louise Reynolds was born to George and Mary Ann (Tuddenhaum) Reynolds on April 1, 1873. She was only 6 when her father was imprisoned for plural marriage and only 12 when her mother died at the birth of the family's eleventh child. Soon after her mother's death, Alice and a younger sister were sent to Brigham Young Academy in Provo to study under Karl G. Maeser. Alice also attended the new Salt Lake City Academy and Brigham Young College in Logan. In 1889 she returned to Brigham Young Academy and graduated with a high school Normal Diploma in May, 1890. The new principal of the Academy, Benjamin Cluff, Jr., visited with Miss Reynolds shortly after graduation and convinced her to attend the University of Michigan to prepare herself for a teaching opportunity at Brigham Young Academy. Alice Louise Reynolds was among the first Mormon women to go East for university study. After studying in Michigan for two years, she returned to the Academy where she received a Bachelor of Pedagogy degree in 1895. In 1897 she was awarded a Bachelor of Didactics degree by the Church Board of Education, and in 1910 she received a Bachelor of Arts degree from the new Brigham Young University. Miss Reynolds was the first woman to teach college-level courses at BYA, and taught all of the literature classes until 1903, when Brigham Young Academy was dissolved, and replaced by Brigham Young High School and Brigham Young University. She was also the first woman to become a full professor at BYU and was an active member of the Utah and National Education Associations. Her thirst for knowledge led her to continue her education throughout her life. She did graduate work at the University of Chicago, Cornell, Berkeley, and Columbia. She also studied in London and Paris. 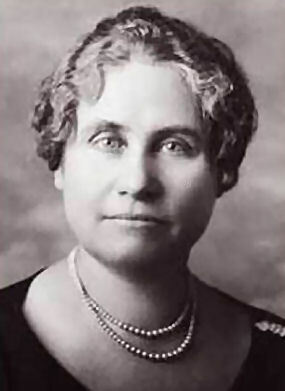 Alice Louise Reynolds was politically active and served as a national Democratic committeewoman and as a delegate to the national convention of the Democratic Party. She also served as a delegate to several women's organizations, including the General Federation of Women's Clubs, the National American Women Suffrage Conventions, and the League of Women Voters at the Pan American Convention. In 1906 a faculty library committee was formed to help establish an adequate library for Brigham Young Academy. Miss Reynolds was a member of the committee from its inception and served as its chair for 19 years. She is especially remembered for her determination to build the library book collection. She headed a fund-raising drive to purchase a major private library held by a Provo judge, J.W.N. Whitecotton. Her active leadership made it possible to obtain the 1,200-volume collection when the school lacked the funds to purchase the books. Later, she organized several campaigns to obtain books and acquire funds which helped the library holdings increase to 100,000 volumes at the time of her death in 1938. Church callings were an important part of her life. She served for 20 years as a member of the Utah Stake Board of the Young Womens Mutual Improvement Association. In 1923 she was called to the General Board of the Relief Society. She became the editor of the Relief Society Magazine, serving in this position for 7 years concurrently with her teaching responsibilities at BYU. She was also instrumental in adding literary lessons to the Relief Society curriculum. Throughout her life Miss Reynolds had many friends and admirers. She was so well respected that former pupils formed a club in her honor. The Alice Louise Reynolds Clubs eventually consisted of 16 official chapters throughout the United States. Alice Louise Reynolds died of cancer on December 5, 1938. In her memory, and in conjunction with the dedication of the Harold B. Lee Library addition in 1977, the Alice Louise Reynolds Room was named as a memorial and permanent tribute to this remarkable teacher and friend of the library. The Alice Louise Reynolds Lecture Series has been established in her honor to feature prominent guest speakers in literature, bibliography, and public service. It is through the generosity of members of the Alice Louise Reynolds Clubs and other Friends of the Library that the endowment for an annual lectureship has been made possible. Unselfish service has a lasting effect on what it touches. The unselfish touch of Alice Louise Reynolds can still be felt at Brigham Young University. The Harold B. Lee Library can trace its beginnings to a committee on which Miss Reynolds served, first as a member and later as chair. She devoted many years to building the dream of a large and comprehensive university library at BYU. Today the Harold B. Lee Library, with more than 3,000,000 volumes, stands as a monument to her dedication and vision. Alice Louise Reynolds: BY Academy High School, Class of 1890, Normal Diploma. BY Academy Collegiate Department, Class of 1895, Bachelor of Pedagogy Diploma. Bachelor of Arts degree from Brigham Young University, 1910. Brigham Young Academy and BYU English teacher, 1895-1938.